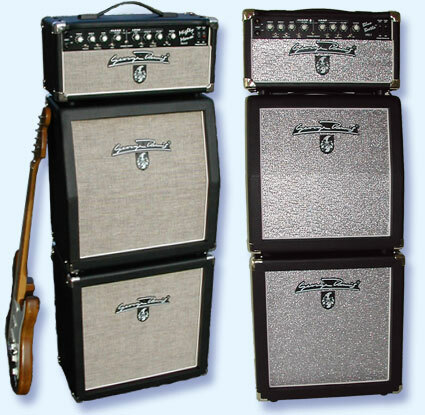 We deliver all our amps and boxes in Black, Salt&Pepper or Blue color. Front cloth may be Silver, Baige or Blue. Attention - new sale policy of George Dennis Ltd. Since May 2007 we will sell our products, Amps, boxes, Effect Pedals and Picks in the following way. Europe Union and Europe: Amplifiers, speaker boxes and Effect pedals - directly to musicians, dealers and intended distributors. Prices in EUR can be found under Info&Support/Retail price/EU and Europe. All prices are door to door including VAT. The GD picks will be sold to dealers and distributors only. Warranty is 2 years long. By some warranty case you will send the product to us, we will repair it for free and send back to you. Before sending please, contact us by e-mail. Our products are tested twice before shipment, therefore we have 1% claims only. The claim will be accepted with original invoice only. The product will be sended by Postal service (to the 30 kg weight) or by the GLS transport forwarder. Vorsicht - neue Verkaufspolitik der George Dennis, GmbH. Ab Mai 2007 werden wir unsere Verstärker, Boxen, Effektgeräte und Plektrum, auf folgende Basis verkaufen. Europäische Union und Europa: Verstärker, Lautschprecherboxen und Effektpedalen - direkt an Musikern, Musikhändlern und autorizierte Distributoren. Die unverbindliche Verkaufspreise in EUR finden sie unten Info&Support/Retail price/EU and Europe. Alle Preise sind inklusive MwSt. und frei Haus. Alle Versandkosten werden auf unsere Seite. Die Garantie ist 2 Jahre. Bei Garantiefall schicken sie das Gerät zu uns und es wird kostenlos repariert und zurückgeschickt. Am bestens kontaktieren sie uns immer vor dem Absendung per E-mail. Unsere Produkte sind problemlos und zwei mahl getestet vor dem Sendung, da wir nur 1% Reklamation haben. Die Garantie wir anerkannt nur mit original Rechnung. Die Produkte werden per Post geschickt (bis zu 30 Kg Gewicht) und bei der GLS Spedition. Pozor - upozornění na novou prodejní politiku George Dennis, s.r.o. Od měsíce května 2007 budeme prodávat naše zesilovače, reproboxy, pedály a trsátka následujícím způsobem. Česká Republika: zesilovače a reproboxy přímo hudebníkům a obchodníkům. Efektové pedály a trsátka jen obchodníkům. Cenníky pro přímé zákazníky v Kč jsou k dispozici pod kolonkou Info&Support/Retail price/Česká republika. Všechny ceny jsou včetně DPH, ale bez dopravného. Toto bude určeno dle váhy produktu. Záruka je 2 roky. V případě garančních oprav zašlete výrobek k nám, ten bude opraven a zdarma zaslán zpět na Vaši adresu. Naše všechny produkty jsou 2x testovány před odesláním, proto docházi jen k 1% záručních případů. Záruční opravy budou uznány jen s originální fakturou nebo paragonem. Výrobky zasíláme Českou poštou (do 30kg váhy) nebo špedicí GLS. 2x10" or 4x10" and 1x12" or 2x12"
This guy will light fire in your hearth! 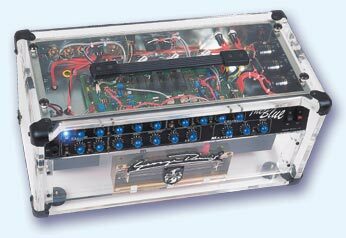 50W RMS, two channel, 4xEL 84 power tubes, 3xECC 83 (12AX7) preamp tubes, 1xGZ 34 Recti tube, 2x10 or 4x10"(P10R) and 1x12" or 2x12" (P12N) Jensen Alnico. Available in BLACK, BLUE or SALT&PEPER color. The front cloth in SILVER, BEIGE or BLUE. Clean channel Controls: Treble, Middle, Bass, Volume, Treble shift, Middle select, Bright. Rear Panel: Reverb control, FX loop blend control, balanced D.I. out, Main voltage 115/230V selector, Foot switch input, Speaker output. Dimensions in mm: 390 (H), 440 (W), 185/205 (D), Slant Baffle-Board and front panel. 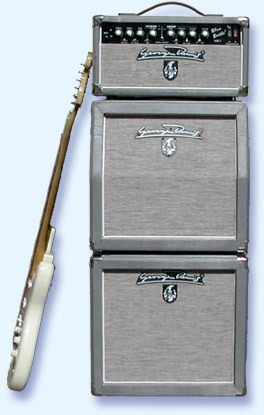 Dimensions in mm: 440 (H), 490 (W), 215/240 (D), Slant Baffle-Board and front panel. It is a pleasure to play. A brand new Wah effect made by introducing a double optical control. 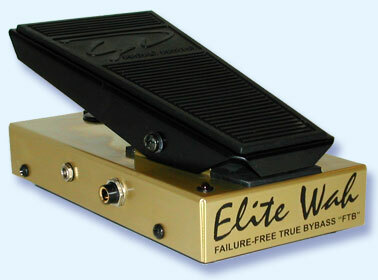 An unmatched wah effect utilizing all harmonic frequencies. Another great sound in small and exclusive cover! Top box: CLUB112ASC - 1x12" Celestion Greenback or G12K 100 - half open. Bottom box: CLUB112BSC - 1x12" Celestion Greenback or G12K 100- closed. This combination gives revolutionary sound powered by the 30W Mighty Mouse Mark II. Small dimensions doesn't mean small sound! 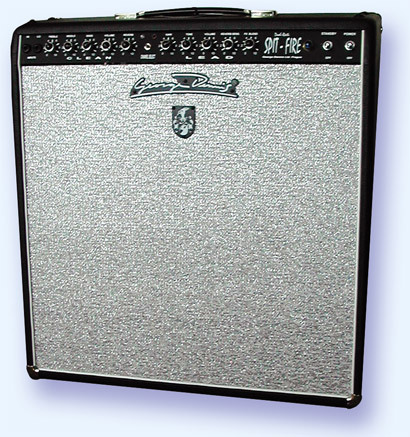 Top box: CLUB112AGC - 1x12" Celestion Greenback or G12K 100 - half open. 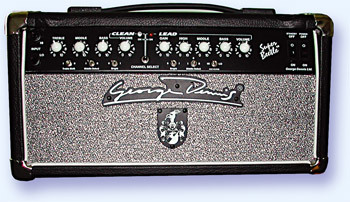 Bottom box: CLUB112BGC - 1x12" Celestion Greenback or G12K 100- closed. Try to talk with your guitar! 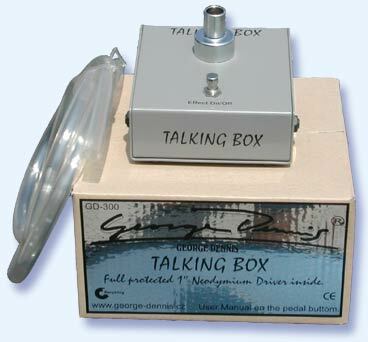 Try the George Dennis Talking Box GD 300! Attach the Talking Box tube close to your microphone and the other end into the adapter on Talking Box. Shape your mouth like you would talk without using your voice. The instrument provides the sound. 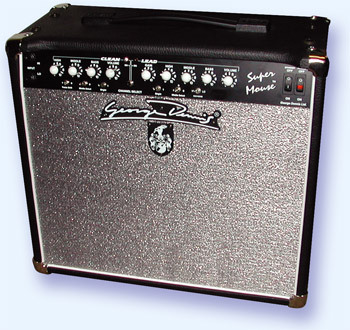 Make sure your Talking Box is always located between your amp and speaker cabinet. To get the best result, stay as close as possible to the microphone. For bypass mode, press the foot switch button again. Our Talking Box features special protection against high amp voltage. We use Neodymium or Titanium 1" driver.